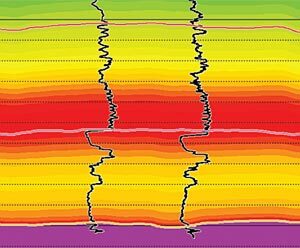 Many interpreters are interested in characterizing fractured reservoirs using 3D surface seismic data, and there are a variety of azimuthal techniques to extract this information from the data. However, once the results from two or more methods are compared the question may arise: why do the results from various azimuthal analysis methods differ? The following discussion is deliberately math-free. This is in response to an oft-heard request: “Please, no equations!” It is hoped that the loss of precision that comes from describing these ideas without using equations is compensated by a fresh perspective on their significance (Figure 1). The techniques ‘see’ different things. Travel time methods – Shear-wave Splitting and Velocity Variation with Azimuth (VVAz) – measure layer properties: they see how the seismic wavefront is affected by traveling through the anisotropic zone. Reflectivity Azimuthal AVO methods measure interface properties: they ‘see’ how the anisotropic layer contrasts to the overlying layer. The techniques ‘see’ different scales, or resolutions. S-wave Splitting and VVAz relate more to trends, while reflectivity AzAVO captures local deviations. All techniques deliver estimates of anisotropy, but to understand these in terms of fracture properties you have to assume a physical model and the measurements mean something different in each model. We then summarize how the anisotropy parameters output by each technique can be compared and formulated in terms of the three rock physics frameworks. 1 S-wave amplitude differences may also be indicators of anisotropy; this method is not discussed here.Interested readers please see Reasnor (2001). Isotropy: the same in all directions. In seismically isotropic material, velocity has no directional dependence. Seismic Anisotropy: velocity varies with direction of travel. For the simple forms addressed in this article, the anisotropy can be described in terms of the symmetry axis. VTI (Vertical Transverse Isotropy): VTI is the special case where the bedding-plane normal is vertical and the beds are horizontal (a simple flat layer cake type model). TTI (Tilted Transverse Isotropy): dipping shales, for example. HTI (Horizontal Transverse Isotropy): a set of vertical fractures, for example. Put simply, subsurface fractures usually occur in sets and are locally aligned in one dominant orientation. The fracture aperture size is typically in the ballpark of hundredths to tenths of a millimetre, and the distance between adjacent fractures is much greater than the fracture aperture. Fracture intensity is less than 0.75 fractures/m for very sparse sets, and may exceed 10 fractures/m for very crowded sets. In contrast, seismic wavelengths are typically tens and hundreds of metres, which means that we can model a fractured zone as a seismically anisotropic solid. Fractures act as speed bumps – they can slow seismic waves traveling perpendicular to them, while waves traveling parallel to them are not really affected. By characterizing the seismic anisotropy, the goal is to work backwards to estimate physical properties of interest such as fracture intensity and orientation (where are the speed bumps and which way are they oriented). When we discuss seismically anisotropic media, we need some way to characterize the physical features and their directional nature. One quickly sees that the complex irregularities of the real-world situation – a porous rock with vertical-ish cracks and fractures – are not easily portrayed by equations. To enable a mathematical description, we turn to a simplified representation of reality. We consider the reservoir rock as having a set of vertical fractures – a horizontally transverse isotropic (HTI) medium (Figure 2) – and explore three rock physics frameworks for explaining HTI anisotropy. While these mathematical models might at first impression looked complicated, they are all based on physical parameters (velocities, fracture aperture, etc.) and they set a foundation for interpreting the anisotropy parameters and for the ‘Comparing Methods’ section of this article. To characterize the directional differences in transversely anisotropic media, five elastic parameters are needed: Young’s elasticity moduli parallel and perpendicular to symmetry, and Poisson’s ratios parallel, perpendicular, and typically at 45° to bedding (that is, 45° to the vertical symmetry axis). Thomsen considered VTI horizontal anisotropic layers (such as shale beds) and showed that for weakly anisotropic rocks, these five elastic constants can be recast into more geophysically accessible parameters: P- and S-wave velocities along the vertical symmetry axis, and three dimensionless fractional parameters γ, ε, and δ. How far these Thomsen parameters deviate from zero characterize the relative strength of anisotropy. By performing a coordinate rotation, Rüger extended the VTI parameterization to the HTI case (such as our set of vertical fractures), giving the Thomsen-style anisotropic parameters γ(v), ε(v), and δ(v) (the superscript (v) denotes that the vertical velocities are used as reference velocities). γ(v) represents the fractional difference between fast and slow S-wave velocities, and is sufficient to determine shear wave velocity at any direction of travel. For compressional waves, the wavefront may be non-elliptical: Pwave velocity becomes a function of both incidence angle and azimuth. To describe it fully, two parameters are needed: ε(v), which is the fractional difference in fast and slow velocity for Pwaves travelling horizontally through the HTI zone, and δ(v) which describes P-waves travelling obliquely (that is, at intermediate incidence angles and not in the isotropy plane). It is important to note that we cannot get ε(v) directly from surface seismic data (because waves travelling horizontally – that is, having incidence angle of 90 degrees – are unlikely to be recorded by surface receivers, even those at the farthest sourcereceiver offsets in the survey). We have to use data from intermediate incidence angles, hence Thomsen’s anisotropy parameter δ(v) is key to characterizing anisotropy for surface seismic data. The physical meaning of δ(v) is a bit elusive to unpack2. It turns out to be a very important parameter for understanding the fractured rock, and we will expand on the significance of δ(v) in the following section, in the context of fracture weaknesses. While Thomsen-style parameters characterize anisotropy, they do not make direct reference to fracture properties, consequently it can be useful to look to more specific models. Linear Slip Theory (LST) is a model that describes fractures as surfaces inside an isotropic host rock (Figure 3). Figure 3. Cartoon representation of (left to right): Actual fractured and porous rock; Linear Slip Theory’s planar fractures; Hudson’s finite penny-shaped cracks. Adapted from Gurevich et al, 2009. LST parameterizes the fractured rock in terms of compliance; compliance is the inverse of stiffness. The total elastic compliance of the fractured rock is the sum of the compliance of the background non-fractured rock plus the excess compliance due to the fractures. The fractures can be parameterized in terms of fracture compliance, or alternatively, fracture weaknesses. This second parameterization describes how fractures weaken a background isotropic rock, and has the advantage of being a fractional value. The stiffness matrix of the HTI media is expressed in terms of elastic parameters λ and μ of the isotropic host rock, and the normal and tangential weaknesses δN and δT of the fracture system3 (δN means normal to the plane of the fractures; δT means along the plane of the fractures4). Normal and tangential weaknesses convey how much of the strain of the fractured rock system is taken up by the fractures (the strain is the displacement due to a normal or tangential stress or force). The normal fracture weakness δN describes how a fractured rock will react to a normal force (a force acting to push the fracture surfaces together) and will be affected by fluid content (a waterfilled crack is more difficult to compress than a gas-filled crack), crack density and aperture. The tangential fracture weakness δT indicates how fractured rock will react to shearing force (a force trying to slide the fracture surfaces across one another) and is unaffected by fluid content. These dimensionless parameters range from 0 to 1; a fracture weakness of 0 means the fracture has no influence on the stiffness of the rock, 1 means that the rock falls apart (has no normal or tangential stiffness). Note that when the LST model is assumed, it is possible to express Thomsen’s anisotropy parameters as scaled versions of normal and tangential fracture weaknesses (the equations are provided in the Appendix). As one might expect, γ(v) – which describes shear wave velocities – is a function of only the tangential fracture weakness. To understand more fully the physical meaning of Thomsen’s δ(v) parameter, it is instructive to observe that while ε(v) is a function of only the normal fracture weakness (remember ε(v) describes the compressional horizontally-traveling velocities), δ(v) – which describes the P-wave anisotropy at oblique incidence – is a function of both normal and tangential fracture weaknesses. This presents itself on surface seismic data as variation of P-wave velocity with azimuth and incidence angle, and is a reason for the complicated P-wavefront shape. 2 Thomsen's anisotropy parameter δ(v) is not simply a scaled ε(v), it is a physical parameter: a non-intuitive combination of stiffness coefficients from the rock’s linear elasticity matrix that are needed to describe P-wave velocity at oblique incidence angles. 3 Unfortunately the literature has used the Greek letter delta, δ, for weakness. This is different from Thomsen’s anisotropy parameter δ. Some literature uses the upper case, Δ, for weakness, but as this has a previous connotation in geophysics as meaning the change in a property across an interface, we will stick with δN and δT for normal and tangential weaknesses of the fracture system, and δ(v) for Thomsen's delta anisotropy parameter in HTI coordinates. No wonder there arises a plea for equation-free summaries! 4 δT can be further decomposed into tangential-vertical ( δV ) and tangential-horizontal (in the fracture plane) ( δH ) weaknesses, but to keep things simple, in this article we disregard this complication. Stress is how hard (with how much force) the solid is being pulled or pushed by a load. Strain is how much the shape of the solid changes as a result. Stress is not the same thing as strain. Strength and stiffness: By strength of a material we usually mean that stress (force) which is needed to break it. Strength is not the same thing as stiffness. Stiffness is a property of the structure. Compliance is the inverse of stiffness. A compliant material is spongy; when you push against it, it absorbs some of your push. Nylon rope is strong and compliant; steel rope is strong and stiff. Weakness is the same concept as compliance, but is dimensionless and cast on a scale from 0 to 1. Hudson’s penny-shaped model is conceptually simple to understand and has been experimentally verified. But it imposes more restrictive assumptions than LST. Hudson’s model considers fractured rock as a single set of parallel penny-shaped cracks in an isotropic host solid (Figure 3). The cracks are ellipsoidal shaped (oblate spheroids) and the cracks are isolated –meaning that the model does not account for possible fluid flow between the cracks. Hudson’s penny-shaped crack model parameterizes anisotropy in terms of crack density ξ, the number of cracks per unit volume, and a fluid term k representing the stiffening effect of the fluid content. It is possible to isolate the fluid effect and the influence of the aspect ratio (crack shape) with a single variable which we call Omega, Ω. When W approaches Ω, we have the dry case (compliant); when Ω approaches infinity, the fluid-filled crack case (stiff). can be parameterized with two variables instead of three. LST has been our “preferred model” in parameterization so far because of the intuitive understanding of weaknesses that it offers, and because it does not require the strong assumption of penny shaped cracks. Now that we have reviewed how seismic anisotropy can be represented by these three simple models, we turn our attention to ways of measuring anisotropy from the seismic data. To estimate any rock property which has a directional quality, one needs to account for the direction of travel of the seismic waves. In 3D surface seismic data, this means that, at every bin within a 3D survey, one must extend the usual prestack analysis to account for azimuth. If the 3D survey was recorded using multicomponent receivers, azimuthal analysis of the mode-converted (PS) data can provide estimates of anisotropy. While compressional waves (P-waves) have particle motion in the direction of wave propagation, shear, or S-waves have a particle motion orthogonal to the direction of wave propagation (Figure 4). In the simplest case, S-wave particle motion is polarized in two directions: horizontal and vertical. A set of parallel fractures, like our HTI vertical fractures, will act as a polarizing filter on a shear wave travelling through the fractured zone. Roughly speaking, the fractures split the converted S-wave into a fast S1 component - aligned parallel to the fracture set - and a slow S2 component - perpendicular to the fracture set. Following appropriate 3C data processing, estimates of fast PS1 polarization and PS1-PS2 time delay may be derived. This operation is performed in a layer stripping manner. This analysis is automated and repeated at every spatial location. Symmetry axis and anisotropy magnitude attributes for the target zone are output. The anisotropy magnitude delivered by the Shear-wave Splitting technique is directly related to Thomsen’s γ(v). VVAz, also known as Azimuthal NMO, examines variation in travel time (velocity) with azimuth to characterize the anisotropy. With the introduction of aligned fractures, the rock structure can no longer transmit compressional waves equally well in all directions. The fractured rock system’s incompressibility is diminished, hence the P-wave velocity is reduced (recall our speed bump analogy). Azimuthal NMO methods simply try to describe how P-wave velocity varies with direction of travel. For short recording offsets – less than or equal to the reflector depth – the variation in NMO velocity with azimuth can be described by an ellipse. This velocity ellipse is a simplified model, characterized by the major axis, Vfast; the minor axis, Vslow; and the azimuthal orientation of Vfast. For most rocks the fast velocity corresponds to the rock matrix, and so the orientation of Vfast is parallel to the fracture strike. The ratio of the two velocities provides an estimate of the magnitude of the anisotropy. The anisotropy magnitude delivered by VVAz is directly related to Thomsen’s δ(v). The analysis of effective anisotropy gives Vfast and Vslow averaged down to the target and is typically used to correct for azimuthal moveout in the data and to improve the imaging. Once the cumulative influence of layers above is removed, then a zone-specific analysis of the anisotropic zone of interest (our set of vertical fractures) is conducted through the use of interval velocities. 5 Shear-wave Splitting is more properly called shear wave birefringence. Near offset Rüger-style Azimuthal AVO is the traditional method that most people think of when one talks about “Azimuthal AVO”. Fractures lower both Vp and Vs, but by differing degrees. This difference in (Vp/Vs)parallel-to-the-isotropy-plane to (Vp/Vs) perpendicular is what drives an azimuthal AVO response. The amplitude gradient will vary with direction, and the largest variation will be between the AVO responses parallel and perpendicular to the isotropy plane. The near offset Rüger-style Azimuthal AVO technique is based on Rüger and Tsvankin’s (1997) near offset (two-term) Azimuthal AVO equation which predicts that at the interface of an isotropic medium overlying an HTI medium, the reflection’s AVO Gradient (B) varies with azimuth in an elliptical fashion between two simple extremes: parallel to the isotropy plane and perpendicular to it. If there is no anisotropy then the AVO Gradient is the same in all directions: Biso. If there is anisotropy, then the AVO Gradient varies with azimuth; in the direction of the symmetry axis, the AVO Gradient is the sum of Biso and Bani at that azimuth. Bani is a measure of how much the anisotropy perturbed the isotropic AVO response. However, and this is a very large ‘however’, the axis of symmetry estimated by Rüger-style AzAVO carries with it an ambiguity of 90° (for example, “The fracture strike is at a bearing of either South or West, but we cannot tell which”). Why? Mathematically, the least-squares solution of the near offset Rüger-style AzAVO equation gives the magnitude of Bani, but it cannot tell us the sign. The equation has a non-unique solution: two answers fit the data equally well. This uncertainty in the sign of the anisotropic gradient Bani translates into a 90° ambiguity in AzAVO’s estimated axis of symmetry (and hence the fracture strike, which is perpendicular to the symmetry axis). The outputs of AzAVO are the azimuth of the axis of symmetry (with a 90° ambiguity), and the Anisotropic Gradient, Bani, which describes how the AVO gradient varies with azimuth. It is important to note that the interpretation of Bani is not straightforward: it is a reflectivity parameter (a measure of contrast from one layer to another) and it is a weighted difference of γ(v), and δ(v). It is only when assuming Hudson’s model that Bani may be interpreted as a direct indicator of fracture density. Azimuthal Fourier Coefficients are also an Azimuthal AVO interface analysis, but the math is handled in a new way. As well, unlike Rüger-style AzAVO, Az FC does not require the assumption of isotropic overlying HTI media, and it is not a near offset approximation; an approximation which, as pointed out by Goodway et al. (2006), can have a strong influence on the results. For HTI media, at any incidence angle, amplitude variation with azimuth is repetitive (Figure 5). One can therefore calculate a Fourier transform of amplitude variation with azimuth at any particular angle of incidence to decompose the waveform into a Fourier series. Figure 5. Amplitude signal versus azimuth extracted at one incidence angle (35 degrees) (left); decomposed into its Fourier coefficients (right). The bulk of the information is captured in the first few Fourier coefficients (FCs) of the series; indeed, coefficients higher than fourth order can be neglected. The properties of the Fourier transform allow AVO and AVAz to be treated as separate problems: the n=0 FC is equivalent to the classic three-term AVO expression, the AVAz part is portrayed by the 2nd and 4th FCs. The anisotropic gradient, Bani, and the symmetry axis can be obtained using the 2nd FC at just one incidence angle (! ), but with some ambiguity in the symmetry axis. By including more angles of incidence and the 4th FC, the symmetry axis ambiguity can be resolved and an improved estimate of the Bani obtained. It is important to remember that with conventional AzAVO methods, one cannot be sure how much of the amplitude variation is due to fracturing and how much is due to isotropic AVO. One of the key advantages of the Az FC method is that since we are examining one incidence angle at a time, we are able to separate the AVO and AVAz and therefore avoid cross-talk between the two. One can push forward and derive fracture parameters, such as weaknesses, which would be more straightforward to interpret than Bani. However these parameters would still be reflectivity parameters, this is one of the important motivations to continue on to a true azimuthal inversion. Az FC Inversion uses all the Azimuthal Fourier Coefficient volumes (simultaneously at each incidence angle) as input and computes a deterministic geologic fractured model that best matches the available data. As well, the solution complies with user-defined physical constraints, such as lateral continuity or realistic weakness values. One important input is the initial model. It is now possible to input a spatially variable Vp/Vs volume which can be derived from a standard isotropic elastic inversion. For the fracture parameters initial model, we typically start from the isotropic case where δT and δN = 0 or introduce a background trend model. In addition to integrating all the available data, the biggest upside of the method is that it solves for layer properties. In comparison to interface reflectivity analyses, the inversion process inherently brings a more stable and objective solution, simplifying the interpretation. The Az FC Inversion approach outputs an unambiguous orientation for each layer, and can be directly parameterized to output fracture properties like normal and tangential weaknesses. From there one can easily remove the anisotropy to correct elastic parameters (such as Poisson’s ratio) to their true isotropic value. When comparing results, it is important to remember that AVAz methods results have the resolution of the seismic bandwidth; VVAz is lower; S-wave Splitting generally lower still, due PS data quality (Figure 6). Figure 6. The typical frequency spectrum of each tool. AVAz methods have higher bandwidth but are missing the low frequencies needed to capture the background trend. VVAz and S-wave Splitting convey information about trends, where AVAz techniques will not capture these trends but local deviations. Usually when we discuss resolution we are concerned with having sufficiently high frequencies to resolve details, but it’s the low frequencies that are needed to establish the background trend. This becomes important when deriving quantitative measurements like stresses, as pointed out by Dave Gray (Gray et al., 2012), and calibrating the results to other measurements. One should keep in mind the inherent differences in resolution of the various methods when interpreting the outputs. For example, the low frequency measurements may give information about regional stresses but cannot be expected to reveal local variations, just as the high frequency measurements may reveal localized variations in the stress field or local natural fractures but ought not to be interpreted as regional trends. These differences in resolution might be why seismically-derived stress estimates which invoke AVAz in their workflow don’t always show the regional dominant stress. Azimuthal inversion can potentially be used as a data integration tool; an initial model can be provided to fill the missing low frequency. The logical next step will be to use VVAz and S-wave Splitting for the background information and input this model for AZ FC Inversion. This approach is still under testing but opens the door to more accurate quantitative analyses. The above azimuthal methods each output two basic anisotropy parameters: axis of symmetry (anisotropy direction), and magnitude (how anisotropic is it). These can be interpreted in terms the rock physics models. It is important to note that the models can be formulated in terms of each other (the equations illustrating this are shown in the Appendix). The table helps us understand when the results from the various azimuthal techniques may be compared. For instance, when formulated in terms of LST we see that anisotropy magnitude measured by S-wave Splitting relates directly to tangential fracture weakness δT, and for VVAz it relates to a weighted sum of δT and δN. Since the weakness values are always positive and the methods have the same property type and resolution, the results from these two techniques could potentially be compared. But one should not expect the result from Rüger-style AzAVO method – being a weighted difference of δT and δN in LST formulation – to be always comparable with the results from VVAz and Shear-wave Splitting methods. In other words, assuming Hudson’s model, the anisotropy parameters output by each method are scaled versions of the crack density, ξ. Each method scales the crack density differently, which interestingly, suggests that each method detects the crack density with varying sensitivity. In fact, as shown in the Appendix, two interesting observations can be made: 1) VVAz (in the gas case) is the most sensitive indicator of fractures (excluding resolution considerations); and 2) Vp/Vs of the background rock has a remarkable influence on the anisotropy detection. In fact, at a Vp/Vs ratio of approximately 1.7 (Bakulin, et al., 2000), there will be no amplitude variation with azimuth; even if the crack density is incredibly high, AVAz Bani parameter won’t detect any anisotropy (a cautionary tale to interpreters: keep the influence of Vp/Vs in mind). The various azimuthal techniques use different approaches to measure seismic anisotropy. They examine different seismic properties in the light of different bandwidths. When used in combination – and with interpretation guided by realistic rock physics frameworks – these techniques can provide the geophysicist with a comprehensive and thoughtful characterization of fractures in complex reservoirs (Figure 7). While it was beyond the scope of this paper to include examples illustrating these different techniques and showing interpretations, the interested reader will find successful applications in the references. The authors are also available to discuss this further (corresponding author: franck.delbecq@cggveritas.com). Figure 7. 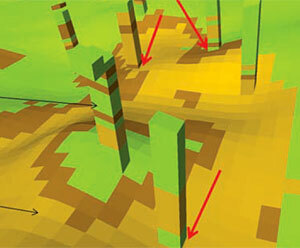 An example of shale gas sweet spot detection via inversion (rock properties) and fracture analysis combined. The authors would like to thank our many colleagues who generously offered helpful advice and suggestions, Benjamin Roure, Richard Bale and David Gray for giving their time and feedback, and Jan Dewar for her assistance in writing this article and being a voice for those who benefit from math-free descriptions. Franck Delbecq is a reservoir group manager with Hampson-Russell, A CGGVeritas Company, and has previously worked in software support and as a reservoir geophysicist. His professional work has been focused on applied reservoir geophysics for both conventional and unconventional resources, with experience in Europe and North America. Franck received a Master of Reservoir Engineering degree in 2005 from the Nancy School of Geology, France, and has worked in Calgary since 2007. Franck has presented multiple papers about stochastic inversion and fracture analysis and enjoys sharing ideas with the geoscience community. Jon Downton is a Senior Research Advisor with Hampson-Russell, A CGGVeritas Company. Jon has worked as a reservoir geophysicist, research geophysicist and research manager, focusing on reservoir geophysics and the seismic processing associated with this. His current research involves the prediction of fractures and stress from seismic anisotropy. Jon has extensive experience in estimating rock and fluid properties from seismic data, including AVO, inversion and rock physics. He is one of the original co-authors of the lambda*rho mu*rho approach to elastic inversion. Jon has presented numerous papers at SEG, EAGE and CSEG conferences, for which he has received several Best Paper awards, most recently the Best Exploration Paper at VII INGEPET in the fall of 2011. He has also been a keynote speaker at CSEG and EAGE conferences. Jon obtained his Ph.D. from the University of Calgary in 2005 and his B.Sc. in Geophysics from the University of Alberta in 1985. Jon is a member of the CSEG, SEG, EAGE and APEGA and is a past president of the CSEG. Mark Letizia is a Reservoir Geoscientist with CGGVeritas in the Hampson-Russell Services team, focusing on multicomponent registration, various forms of inversion and fracture analysis. Mark has worked on unconventional resource plays – from shale gas to heavy oil – for major oil and gas clients. He has a Bachelor of Science Degree in Geophysics with a minor in Geology from the University of Calgary. Mark is a member of the Canadian Society of Exploration Geophysicists (CSEG) and the Society of Exploration Geophysicists (SEG). We have attempted to indicate which papers may be of most relevance to the reader interested in a particular topic. Of course, there is overlap between the papers and we feel they are all worth a read! Delbecq, F., et al, 2011, A Comparison of Azimuthal Seismic Techniques , 2011 CSPG CSEG CWLS Convention, Calgary. Hunt, L., et al., 2010, Am I Really Predicting Natural Fractures in the Tight Nordegg Gas Sandstone of West Central Alberta? , GeoCanada 2010 CSPG CSEG CWLS Joint Convention, Calgary, Alberta. Perez, M., 2010, Beyond Isotropy – Part I: A Prestack Perspective , CSEG RECORDER, 35, No. 7, 36-41. Perez, M., 2010, Beyond Isotropy – Part II: Physical Models in LMR Space , CSEG RECORDER, 35, No. 8, 37-43. Bakulin, A., Grechka, V., and Tsvankin, I., 2000. Estimation of fracture parameters from reflection seismic data—Part I: HTI model due to a single fracture set , Geophysics, 65, 1788-1802. Gurevich, B., and Pervukhina, M., 2010, An analytical model for stress induced anisotropy of a cracked solid , SEG, Expanded Abstracts, 29, 2517-2521. Hudson, J. A.,1988, Seismic wave propagation through material containing partially saturated cracks : Geophysical Journal International, 92, 33–37. Hudson, J. A., Liu, E., and Crampin, S., 1996, The mechanical properties of materials with interconnected cracks and pores : Geophysical Journal International, 124, 105–112. Schoenberg, M., 1980, Elastic wave behavior across linear slip interfaces : J. Acoust. Soc. Am., 68, 1516–1521. Thomsen, L.A., 1986, Weak elastic anisotropy : Geophysics, 51, 1954-1966. Bale, R., and Wright, C., 2009, Compensation for shear-wave anisotropy effects above a heavy oil reservoir , 2009 CSPG CSEG CWLS Convention, Calgary. Kendall, R. and Wikel, K., 2012, Multicomponent time-lapse monitoring of bitumen recovery and geomechanical implications , 2012 GeoConvention, Calgary. Tsvankin, I., 1997, Reflection moveout and parameter estimation for horizontal transverse isotrop y: Geophysics, 62, 614–629. Goodway, W., Varsek, J. and Abaco, C., 2006, Practical applications of P-wave AVO for unconventional gas Resource Plays, Part 2 , CSEG RECORDER, 31, No. 4, 52-65. Gray, F. D., and Todorovic-Marinic, D., 2004, Fracture detection using 3D azimuthal AVO , CSEG RECORDER, 29, No. 10, 5-8. Rüger, A., 1996, Reflection Coefficients and Azimuthal AVO Analysis in Anisotropic Media , Doctoral Thesis, Center for Wave Phenomena, Colorado School of Mines. Rüger, A., 2002, Reflection coefficients and azimuthal AVO Analysis in anisotropic media : SEG Geophysical Monograph Series No. 10. Rüger, A., and Tsvankin, I., 1997, Using AVO for fracture detection: Analytic basis and practical solutions : The Leading Edge, 10, 1429-1434. Downton, J., and Roure, B., 2012, Azimuthal Fourier Coefficients: A simple method to estimate fracture parameters , 2012 GeoConvention, Calgary. Downton, J., Roure, B., and Hunt, L., 2011, Azimuthal Fourier Coefficients , CSEG RECORDER, 36, No. 10, 22-36. Roure, B., and Downton, J., 2012, Azimuthal Fourier Coefficient Elastic Inversion , 2012 GeoConvention, Calgary. Gordon, J.E., 1984, The New Science of Strong Materials or Why You Don’t Fall Through the Floor , Princeton University Press. Here we provide the major equations for the topics discussed. The equations can provide an extra degree of understanding, complementing the preceding math-free physical explanations. Please note: this section talks only about Horizontal velocities. The bulk of the information is captured in the first few Fourier coefficients of the series; coefficients higher than fourth order can be neglected. And because of reciprocity (the locations of the source and receiver are interchangeable), only the even order Fourier Coefficients are non-zero, so the odd FCs can be neglected. Anisotropy coefficient as a function of Vp/Vs background, for various azimuthal methods. The x-axis is Vp/Vs. Note that there is a background Vp/Vs ratio (around 1.7) for which AVAZ(gas case) Bani might not detect the crack density (the AVAz gas case line crosses 0). Figure App-2. Anisotropy coefficient as a function of crack density, for Vp/Vs=2.5. The x-axis is crack density ξ.